In this range you can find bottle openers and corkscrews. Bottle opener in stainless steel. Bottle opener with a perfect grip. Nice on the table. Made in stainless steel with black handle in polypropylene. 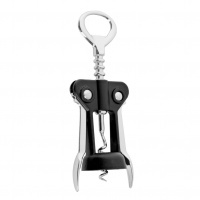 Corkscrew in stainless steel and polypropylene. Corkscrew made of zinc and polypropylene.